By Mike Smith: Unified cruiserweight champion Oleksander Usyk says it’s fake news about the rumors that have been spreading around the boxing world that he’ll be challenging IBF/WBA/WBO heavyweight champion Anthony Joshua on April 13 at Wembley Stadium in London, England. Usyk, 31, says he’s not even sure if he’ll be moving up to heavyweight. Usyk’s small frame, lack of punching power, and his reliance on his mobility will make it near him impossible for him to move up to heavyweight and have an impact. Usyk will lose his speed and mobility if he gains muscle mass to compete at heavyweight, and there’s no guarantees that his power will be improved in a significant manner. It’ll take a lot of self control for Usyk not to go in the direction of a fight against Joshua. That’s where Usyk will make life-changing money, not at cruiserweight, which is a division barren of stars and talent. It doesn’t matter if Usyk loses to Joshua. It’ll still likely make him more money than what he’s made his entire five-year pro career. Usyk is viewed as the best fighter in the cruiserweight division today, but if he moves up to heavyweight, he’s not going to be the best due to his small size and lack of punching power. Usyk’s promoter Eddie Hearn of Matchroom, wants to put him in with Joshua in a big UK fight. 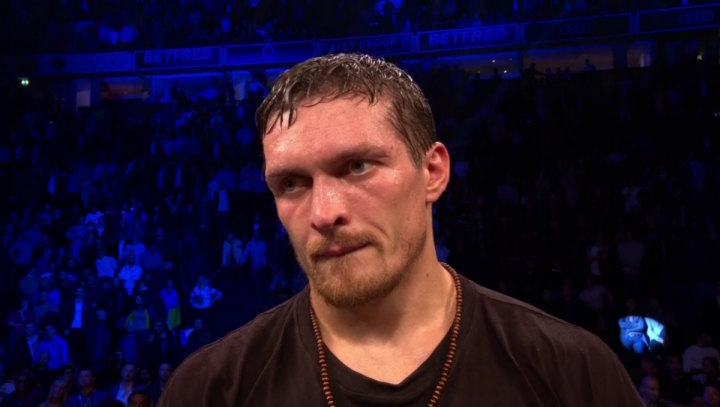 If Usyk (16-0, 12 KOs) chooses to play it safe by staying at cruiserweight, it’s going to be a disappointment for Hearn. The money fight for Hearn, Joshua and Usyk is Joshua-Usyk. There’s no one left at cruiserweight for Usyk to fight to make a good payday after his recent 8th round knockout victory over former World Boxing Council champion Tony Bellew last month on November 10 in Manchester, England. The only option for a big payday for Usyk at cruiserweight is if Andre Ward comes out of retirement to fight him, which it doesn’t appear he’s interested in doing. Hearn won’t be happy to hear Usyk saying that he might not move up to heavyweight, since he’s been talking up a fight between them lately. If that fight never happens, then Hearn will make a lot less money having Usyk in his stable. If Usyk moves up to heavyweight, Hearn can match him against all of his Matchroom Boxing fighters like Joshua, Dave Allen, Dereck Chisora and Dillian Whyte. Hearn has already put Usyk in with Tony Bellew, and that fight made a lot of money. But the real pot of gold for Hearn is if Usyk fights Joshua. Then the money will rain from the sky on Joshua, Usyk, Hearn and his Matchroom Sport promotions. If Usyk stays at cruiserweight, he can fight the winner of the World Boxing Super series tournament, which could well be Mairis Briedis or Yunier Dorticos. There would be some interest from fans in seeing Usyk fight one of those two guys, but there won’t be nearly as much interest than the Joshua-Usyk fight. It’s not even close.